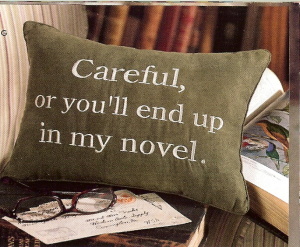 Watch Out, or You’ll End Up in My Novel – or, Telling Lies for Fun and Profit. I watch people. It’s true – I don’t necessarily LIKE them a lot, but I watch them. In person, online, on television. And sure shooting, they’ve ended up in my novel. And my blog. I’ve written a ton of non-fiction in my time, because that’s what I got paid for. Ever read a blog post on choosing an RV refrigerator? I probably wrote that. How about the history of cufflinks? I probably wrote that, too. I wrote a lot of boring, boring stuff. Really boring. Like – falling asleep over my keyboard after a pot of coffee boring. Seriously. It was hard, ya’ll. You don’t even know. But I switched the focus to fiction, even though it pays less (as in nada till I get it sold), and I’m a lot happier. And more awake. And I’m finding that the people watching I do is paying off in terms of fodder for the keyboard. Sad for you if you were one of them, but chances are you don’t know me or read this, so it’s probably cool. Surprisingly in this day and time, my own life is fairly devoid of drama. I like it like that. I get up, I throw words at paper, I school my kiddo, I pick up heavy things and put them down, and at night, I get to curl up next to the Big Guy. He occasionally kicks and snores, but I love him so much I just don’t care. And he’s really warm. I think I’ll keep him. The thing is, when your life is devoid of drama, you get a nice, clear view of all the drama AROUND you, and then your writer brain kicks in if you’re a writer, and boom. And since I do this blogging thing basically to keep my gears lubricated, there you go. The funny stuff you read, yeah, that happened. ‘Cause I’m not good at writing funny stuff and I can’t make that crap up to save my life. My political statements, and posts on things like Memorial Day and Veteran’s Day? You should take those seriously, because I can do serious if I try really hard and fortify myself with chocolate. The rest of it? I’ve got notes on drama that would keep me writing till mid-2087. Ya’ll need Jesus. I’m not even joking. I feel like it’s been a long time since I’ve written a funny post. This isn’t one, either, but it is an important one, I think, and I hope you’ll bear with me to the end. This Monday is Memorial Day. It’s not Barbeque Day, or Pool Opening Day, or Buy A Lot of Crud Day. It’s not a day that you wish someone a “happy” one of. Does that mean that you shouldn’t have a cookout, or go to the pool, or buy a lot of crud? No. It doesn’t. In fact, you probably SHOULD do those things, at least the first two, but I want you to remember WHY you’re able to do those things, and I want you to spare a thought for those to whom this day strikes nerves still raw. This is the day that we, as a country, have set aside to honor those who died while in service to the United States. That we as a people NEED to stop and reflect on those who paid the price for the freedoms that we enjoy, and to remember that those freedoms aren’t free; we are just so fortunate that someone else paid what was due. We need to remember the pain of every parent who has buried a son or daughter, every spouse who buried a husband or wife, every child who lost a mother or father. Every Soldier, Sailor, Airman, Marine, and Coast Guardsman who has lost brothers and sisters in arms, for those bonds run deep. I want you to enjoy your day. I want you to eat with your family, play games with your children, laugh with your friends. I want you to do these things because brave, brave souls gave all their tomorrows so you COULD have this day. I just want us all to be grateful. May your Memorial Day be one of honor, of remembrance, of gratitude, and of love.